nebusresearch – Page 2 – Joseph Nebus's work in progress. I got to thinking about unit fractions. This is in the service of a different problem I might get around to talking about. Unit fractions are fractions, yeah. They allow the denominator to be any counting number. The numerator is always 1, that is, the unit. So, like, , , , these are all unit fractions. Particularly I was thinking about sums of unit fractions. And whether the sum of a particular group of unit fractions is less than or greater than one. Like, is greater than one, sure. But is less than one. But is ? Is there an easy way to tell? I mean easier than addition, which is admittedly pretty simple to start with. Might be fun to spot a straightforward way to do this. The trouble with number theory problems is they pretty much break one of two ways. One is that we have an answer and can prove it. The proof is this 12-line thread of argument so tight you can cut yourself on the reducto-ad-absurdum. Allow a couple symbols and you could fit the thing in two tweets. The other way a number theory problem can break is “well, after 120 years of study, we have a 60-page proof that seems to answer a specialized case of this problem, if we assume that the Riemann hypothesis is true”. Or possibly “if we assume the continuum hypothesis is [ true or false ]”. Anyway, there are people who have some doubts about the section between pages 38 and 44. I haven’t poked around the literature, not even Wikipedia, yet. So I don’t know which kind this is more likely to be. My suspicion is there’s probably some neat 12-line proofs. Unit fractions are terms in the “harmonic series”. This is the number you get by adding together , carrying on with the denominator going through every whole number ever. This series turns out to “diverge”. You go ahead and pick any number you like. I can then pick a finite set of terms from the harmonic series. And my set of terms will add up to something bigger than your number. And yet other weird stuff happens. Like, pick any string of digits you like. I’ll say ’35’ because I’m writing this sentence at 35 minutes past the hour. Keep the whole harmonic series except for any terms which have the sequence ’35’ in them. So, no , no , no , no . Although is still in. Add up the infinitely many terms that remain. That will “converge’, adding up to some finite number. So you see I’m looking at a problem that’s in well-explored waters. This makes me also suspect there isn’t a better answer than “just add your fractions up”. If there were, it would probably be a mildly well-known trick used for arithmetic magic tricks. Or, possibly, as an odd trick used to squeeze some other proof down to 12 lines. I couldn’t leave people just hanging on that triangle theorem from the other day. Tthis was a compass-and-straightedge method to split a triangle into two shapes of equal area. The trick was you could split it along any point on one of the three legs of the triangle. The theorem unsettled me, yes. But proving that it does work is not so bad and I thought to do that today. The process: start with a triangle ABC. Pick a point P on one of the legs. We’ll say it’s on leg AB. Draw the line segment from the other vertex, C, to point P.
Now from the median point S on leg AB, draw the line parallel to PC and that intersects either leg AC or leg BC. Label that point R. The line segment RP cuts the triangle ABC into one triangle and another shape, normally a quadrilateral. Both shapes have the same area, half that of the original triangle. To prove it nicely will involve one extra line, and the identification of one point. Construct the line SC. Lines SC and PC intersect at some point; call that Q. I’ve actually made a diagram of this, just below. I’ve put the intersection point R on the leg AC. All that would change if the point R were on BC instead would be some of the labels. I know, I know, it goes against my whole brand around here to go including a picture where one would really help clear up things. Also it’s not until you start drawing a sketch like this, and realize how much easier it is to read if you have a couple different colors, that you realize how few colors of marker you have accessible in the house at any one time. Here’s how the proof will go. I want to show triangle APR has half the area of triangle ABC. The area of triangle ARP has to be equal to the area of triangle ASC, plus the area of triangle SPQ, minus the area of triangle QCR. So the first step is proving that triangle ASC has half the area of triangle ABC. The second step is showing triangle SPQ has the same area as does triangle QCR. When that’s done, we know triangle APR has the same area as triangle ASC, which is half that of triangle ABC. First. That ASC has half the area of triangle ABC. The area of a triangle is one-half times the length of a base times its height. The base is any of the three legs which connect two points. The height is the perpendicular distance from the third point to the line that first leg is on. Here, take the base of triangle ABC to be the line segment AC. Also take the base of triangle ASC to be the line segment AC. They have the same base. Point S is the median of the line segment AB. So point S is half as far from the base AC as the point B is. Triangle ASC has half the height of triangle ABC. Same base, half the height. So triangle ASC has half the area of triangle ABC. Second. That triangle SPQ has the same area as triangle QCR. This is going to be most easily done by looking at two other triangles, SPC and PCR. They’re relevant to triangles SPQ and QCR. Triangle SPC has the same area as triangle PCR. Take as the base for both of them the leg PC. Point S and point R are both on the line SR. SR was created parallel to the line PC. So the perpendicular distance from point S to line PC has to be the same as the perpendicular distance from point R to the line PC. Triangle SPC has the same base and same height as does triangle PCR. So they have the same area. Now. Triangle SPC is made up of two smaller triangles: triangle SPQ and triangle PCQ. Its area is split, somehow, between those two. Triangle PCR is also made of two smaller triangles: triangle PCQ and triangle QCR. Its area is split between those two. The area of triangle SPQ plus the area of triangle PCQ is the same as the area of triangle SPC. This is equal to the area of triangle PCR. The area of triangle PCR is the area of triangle PCQ plus the area of triangle QCR. And that all adds up only if the area of triangle SPQ is the same as the area of triangle QCR. So. We had that area of triangle APR is equal to the area of triangle ASC plus the area of triangle SPQ minus the area of triangle QCR. That’s the area of triangle ASC plus zero. And that’s half the area of triangle ABC. Whatever shape is left has to have the remaining area, half the area of triangle ABC. It’s still such a neat result. 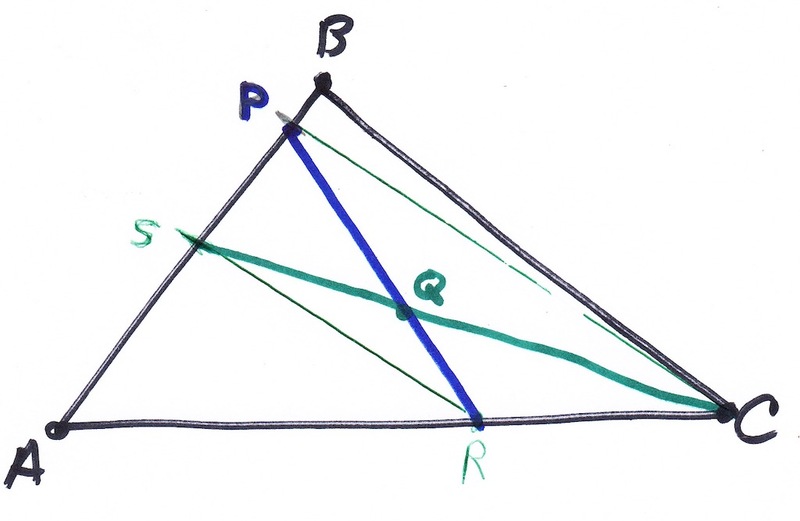 Morley’s theorem, by the way, says this: take any triangle. Trisect each of its three interior angles. That is, for each vertex, draw the two lines that cut the interior angle into three equal spans. This creates six lines. Take the three points where these lines for adjacent angles intersect. (That is, draw the obvious intersection points.) This creates a new triangle. 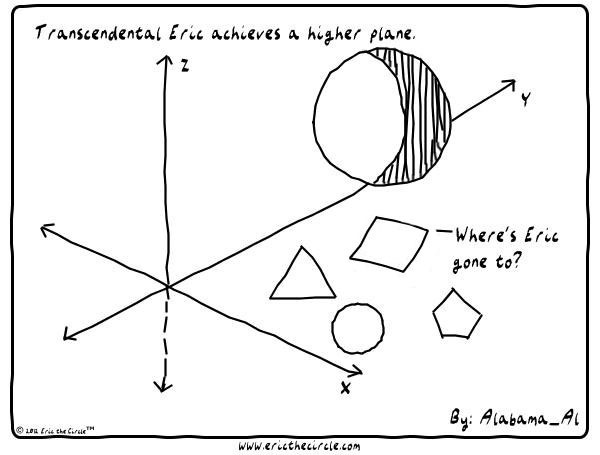 It’s equilateral. What business could an equilateral triangle possibly have in all this? Exactly. I’ve been reading Alfred S Posamentier and Ingmar Lehmann’s The Secrets of Triangles: A Mathematical Journey . It is exactly what you’d think: 365 pages, plus endnotes and an index, describing what we as a people have learned about triangles. It’s almost enough to make one wonder if we maybe know too many things about triangles. I admit letting myself skim over the demonstration of how, using straightedge and compass, to construct a triangle when you’re given one interior angle, the distance from another vertex to its corresponding median point, and the radius of the triangle’s circumscribed circle. But there are a bunch of interesting theorems to find. I wanted to share one. When I saw it I felt creeped out. The process seemed like a bit of dark magic, a result starting enough that it seemed to come from nowhere. Here it is. Now. Pick the midpoint of the leg AB. This median is a point we’ll label S.
Draw the line parallel to the line PC and which passes through S. This will intersect either the line segment BC or the line segment AC. Whichever it is, label this point of intersection R.
Draw the line from R to P.
The line RP divides the triangle ABC into two shapes, a triangle and (unless your P was the median point S) a quadrilateral. The punch line: both shapes have half the area of the original triangle. I usually read while eating. This was one of those lines that made me put the fork down and stare, irrationally angry, until I could work through the proof. It didn’t help that you can use a technique like this to cut the triangle into any whole number you like of equal-area wedges. I’m sure this is old news to a fair number of readers. I don’t care. I haven’t noticed this before. And yes, it’s not as scary weird magic as Morley’s Theorem. But I’ve seen that one before, long enough ago I kind of accept it. I think there are just barely enough comic strips from the past week to make three essays this time around. But one of them has to be a short group, only three comics. That’ll be for the next essay when I can group together all the strips that ran in February. One strip that I considered but decided not to write at length about was Ed Allison’s dadaist Unstrange Phenomena for the 28th. It mentions Roman Numerals and the idea of sneaking message in through them. But that’s not really mathematics. I usually enjoy the particular flavor of nonsense which Unstrange Phenomena uses; you might, too. John McPherson’s Close to Home for the 29th uses an arithmetic problem as shorthand for an accomplished education. The problem is solvable. Of course, you say. It’s an equation with quadratic polynomial; it can hardly not be solved. Yes, fine. But McPherson could easily have thrown together numbers that implied x was complex-valued, or had radicals or some other strange condition. This is one that someone could do in their heads, at least once they practiced in mental arithmetic. John McPherson’s Close to Home for the 29th of January, 2019. Essays inspired by Close To Home should appear at this link. I feel reasonably confident McPherson was just having a giggle at the idea of putting knowledge tests into inappropriate venues. So I’ll save the full rant. But there is a long history of racist and eugenicist ideology that tried to prove certain peoples to be mentally incompetent. Making an arithmetic quiz prerequisite to something unrelated echoes that. I’d have asked McPherson to rework the joke to avoid that. Zach Weinersmith’s Saturday Morning Breakfast Cereal for the 29th of January, 2019. Every Reading the Comics essay has a bit of Saturday Morning Breakfast Cereal in it. The essays with a particularly high Breakfast Cereal concentration appear at this link, though. 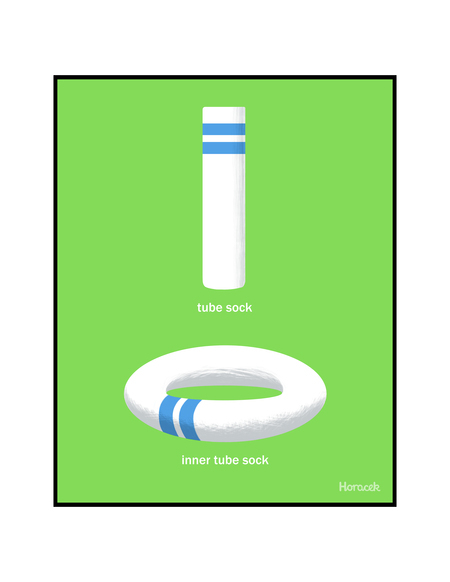 Zach Weinersmith’s Saturday Morning Breakfast Cereal for the 29th riffs on the problem of squaring the circle. This is one of three classical problems of geometry. The lecturer describes it just fine: is it possible to make a square that’s got the same area as a given circle, using only straightedge and compass? There are shapes it’s easy to do this for, such as rectangles, parallelograms, triangles, and (why not?) this odd crescent-moon shaped figure called the lune. Circles defied all attempts. In the 19th century mathematicians found ways to represent the operations of classical geometry with algebra, and could use the tools of algebra to show squaring the circle was impossible. The squaring would be equivalent to finding a polynomial, with integer coefficients, that has as a root. And we know from the way algebra works that this can’t be done. So squaring the circle can’t be done. The lecturer’s hack, modifying the compass and straightedge, lets you in principle do whatever you want. The hack isn’t new either. Modifying the geometric tools changes what you can and can’t do. The Ancient Greeks recognized that adding some specialized tools would make the problem possible. But that falls outside the scope of the problem. Which feeds to the secondary joke, of making the philosophers sad. Often philosophy problems test one’s intuition about an idea by setting out a problem, often with unpleasant choices. A common problem with students that I’m going ahead and guessing are engineers is then attacking the setup of the question, trying to show that the problem couldn’t actually happen. You know, as though there were ever a time significant numbers of people were being tied to trolley tracks. (By the way, that thing about silent movie villains tying women to railroad tracks? Only happened in comedies spoofing Victorian melodramas. It’s always been a parody.) Attacking the logic of a problem may make for good movie drama. But it makes for a lousy student and a worse class discussion. Ted Shearer’s Quincy for the 30th of January, 2019. It originally ran the 6th of December, 1979. I’m usually happy when I get the chance to talk about this strip. The art’s pretty sweet. When I do discuss Quincy the essays should appear at this link. Ted Shearer’s Quincy rerun for the 30th uses a bit of mathematics and logic talk. It circles the difference between the feeling one can have about the rational meaning of a situation and how the situation feels to someone. It seems like a jump that Quincy goes from being asked about logic to talking about arithmetic. Possibly Quincy’s understanding of logic doesn’t start from the sort of very abstract concept that makes arithmetic hard to get to, though. There should be another Reading the Comics post this week. It should be here, when it appears. There should also be one on Sunday, as usual. It seems like about fifteen minutes ago I was looking over how 2018 treated my mathematics blog. But who am I to argue with the calendar? I have a hard enough time convincing the calendar that 1998 was at most eight years ago. My arguments are useless. Look, I clearly remember watching Star Trek Nemesis , opening weekend, alone except for the friend I talked into seeing this with, and there is no possible way that this was one minute more than six years ago. Well, here’s what I can say about my readership and how much blame I can take for it, within the scope of the first month of 2019. I’m sure someday I’ll reach the heights of 2,000 page views in a month again, if I can find a way to write the how-many-grooves-are-on-a-record’s-side article again. I posted twelve things in January, and two of them were looks at what was popular previously. Considering that, though, people were interested. I suspect it’s spillover of the A-To-Z posts. There were 1,375 pages viewed, down a little from December’s 1,409 and November’s 1,611. Considering how much less effort January was, this seems like a great tradeoff. There were 856 unique visitors, compared to December’s 875 and November’s 847. In November I had 23 posts and December 17, so I’m at least being very efficient, per post, at drawing readers. I hadn’t had a 12-post month since July, when there were 1,058 page views and 668 unique visitors. Probably people were hanging around hoping to see more A-To-Z grade stuff. The number of items liked dropped to 63. There had been 82 in December and 85 in November. Again, per post, that’s a pretty good rate of growth. There were 22 comments, up from December’s 17, down from November’s 36, and still pretty close to nothing when you consider I try to answer every comment, so half of all that writing is just me. There was an outright surprise among the most popular posts of the month. Do you see which one doesn’t seem to belong here? And can you spot in which one I originally wrote ‘2018’ in the subject line, and corrected it, but it’s too much trouble to correct a WordPress URL for me to bother with? Well, I’m delighted to see interest in the Five-Color Map theorem. It’s not so famous as the (correct) Four-Color Map theorem. But it’s one with a proof a normal mortal can follow. The Insights panel tells me there were an average of 1.9 comments per post, through the end of January. 4.8 average likes per post, too. There were a meager 11,588 words posted in January, but that still averages to 966 words per post. That’s down from the 2018 average. It’s still my second-highest word count, though. It’s all right. I’ve thought of some things I could post that would be amusing and quite short to write, and that require I do calculations that might be fun in my spare time. This supposes that I have spare time. How about the running of the countries? Really the most startling part to me are the eighteen page views each from Macedonia and American Samoa. This seems like more per-capita readers than I might expect. 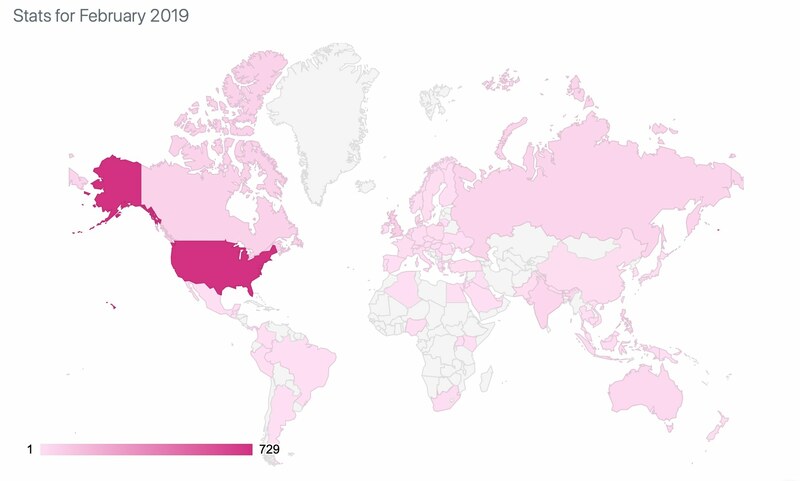 There were 59 countries listed as sending me any readers in January. That’s way down from December’s 68 and November’s 70. 19 of them were single-reader countries, up from December’s 17 and November’s 13. Argentina, Iraq, Japan, and Jordan were single-reader countries last month too. Saudi Arabia’s been a single-reader country for three months now. Colombia’s on a six-month streak now. I could swear Colombia has done this before, too, although good luck my finding the time when. Searching for ‘Colombia’ in my archives is not as helpful as you might imagine. Oh, I can find a time in late 2015 through early 2016 when I had a single European Union reader each month, six months in a row. Maybe that’s what I was thinking of. I began the month having ever had 74,290 page views, from an acknowledged 37,119 unique readers. I’m glad you’re one of them, at least right now. You can put my posts in your RSS reader and enjoy them at your convenience. If you do that, you won’t show up in any of my statistics. I’ll never know you read any of this unless you comment. And that’s fine by me. I’m happy with people keeping their privacy. If you’re using WordPress regularly you can also add me to your WordPress Reader. That’s from the button at the upper-right corner of the page. On Twitter I’m @Nebusj. 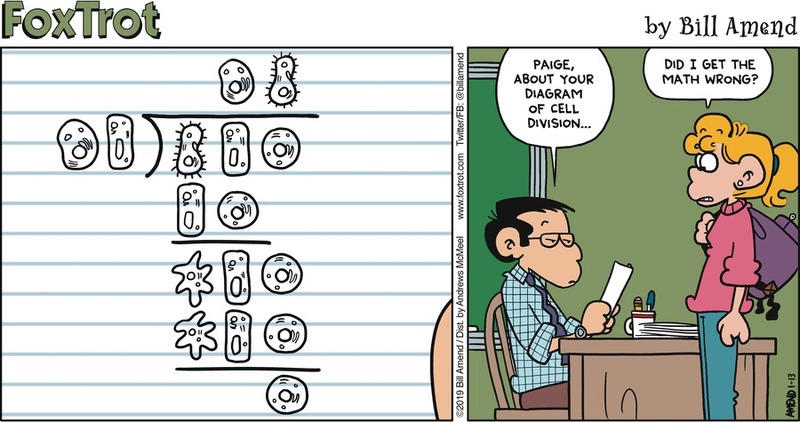 and at least once a week I go around Reading the Comics for the mathematics stuff. Thanks for being here. There are some subjects that seem to come up all the time in these Reading the Comics posts. Lotteries. Roman numerals. Venn Diagrams. The New Math. 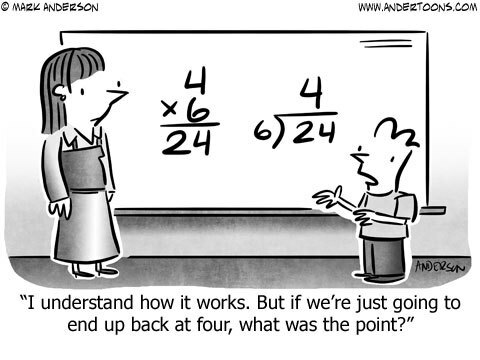 Kids not doing arithmetic well, or not understanding when they do it. This is the slate of comics for today’s discussion. 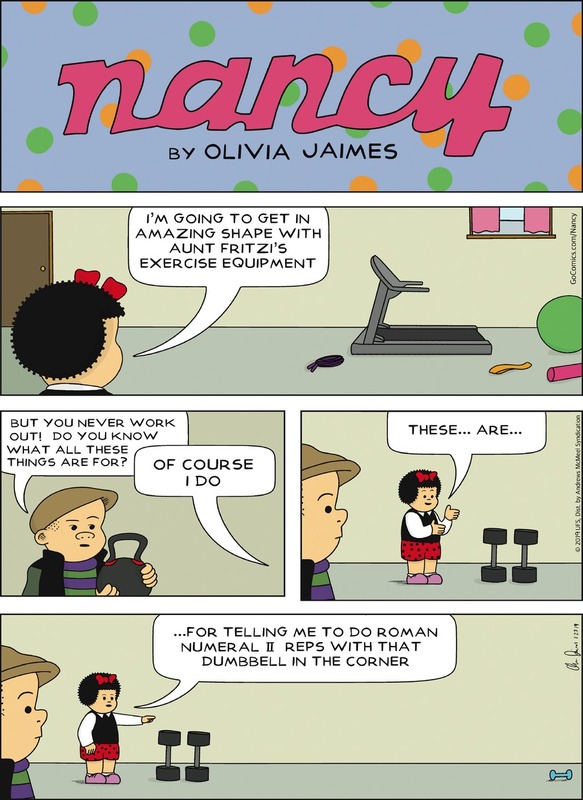 Olivia Jaimes’s Nancy for the 27th is the Roman Numerals joke for the week. I am not certain there is a strong consensus about the origins of Roman numerals. It’s hard to suppose that the first several numerals, though, are all that far from tally marks. Adding serifs just makes the numerals probably easier to read, if harder to write. I’ll go along with Nancy’s excuse of using the weights to represent work with a lesser weight. Olivia Jaimes’s Nancy for the 27th of January, 2019. When I make an excuse to write about Nancy the results should be at this link. 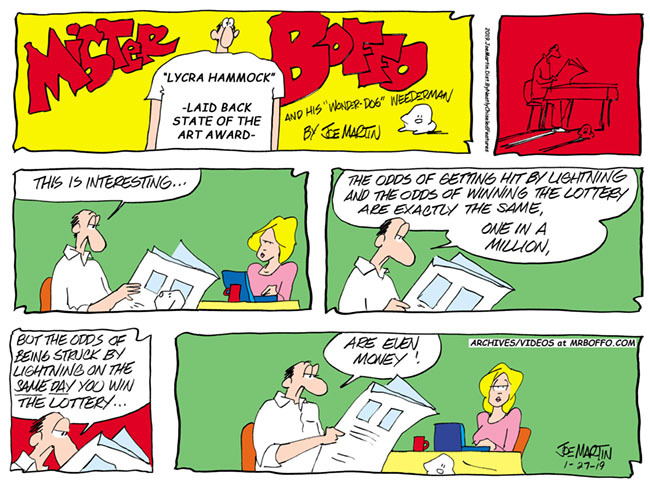 Joe Martin’s Mr Boffo for the 27th is a lottery joke. And a probability joke, comparing the chances of being struck by lightning to those of winning the lottery. This gives me an excuse to link back to The Wandering Melon joke about the person who suffered both. And that incident in which a person did both win the lottery and get struck by lightning, albeit several years apart. Joe Martin’s Mr Boffo for the 27th of January, 2019. I can’t find a way to link specifically to a particular day’s strip, but the previous link will bring one to the archives page. 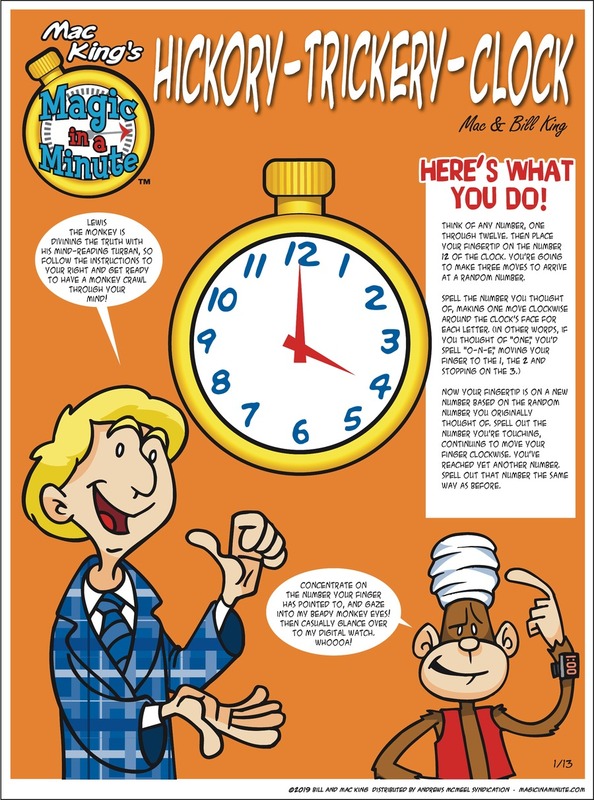 This seems to be the first time I’ve written about Mr Boffo since 2017, but all the essays when I did should be here. Rick DeTorie’s One Big Happy for the 28th has the kid, Joe, impressed by something that he ought to have already expected. Grandpa uses this to take a crack at “that new, new math”, as though there were a time people weren’t amazed by what they should have deduced. Or a level of person who’s not surprised by the implications. One of Richard Feynman’s memoirs recounts him pranking people who have taken calculus by pointing out how whatever way you hold a French curve, the lowest point on it has a horizontal slope. This is true of the drafting instrument; but it’s also true of any curve that hasn’t got a corner or discontinuity. Rick DeTorie’s One Big Happy for the 28th of January, 2019. 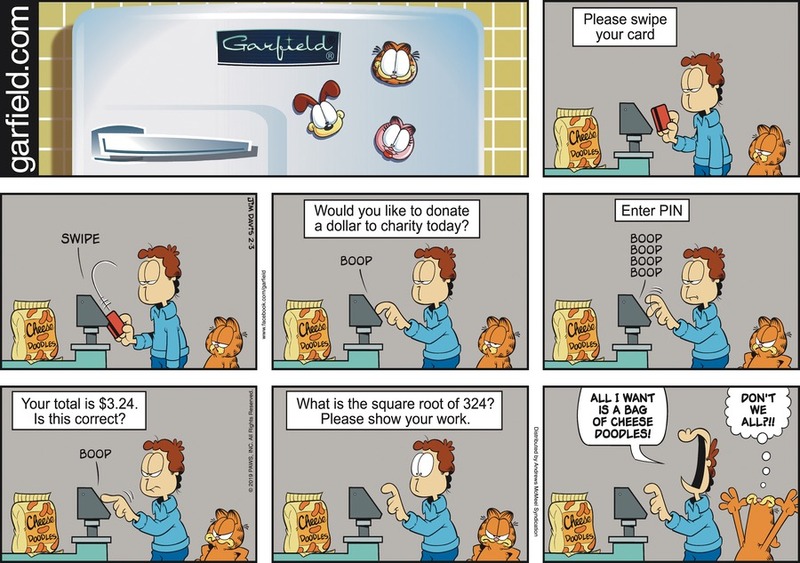 There are two different strips online daily for One Big Happy and essays mentioning either are here. There aren’t comments (so far as I’m aware) on Creators.com, which hosted this strip. So there weren’t any cracks about Common Core. But I am curious whether DeTorie wrote Grandpa as mentioning the New Math because the character would, plausibly, have seen that educational reform movement come and go. Or did DeTorie just riff on the New Math because that’s been a reliable punching bag since the mid-60s? Liniers’s Macanudo for the 28th of January, 2019. This seems to be the first essay I’ve written for this strip. But any mentions of Macanudo from here on should be at this link. Liniers’s Macanudo for the 28th is the Venn Diagram joke for the week. And it commits to its Venn-ness. This did make me wonder whether John Venn did marry. Well, he’d taught at Cambridge in the 19th century. Sometimes marrying was forbidden. He married Sussanna Carnegie Edmonstone in 1867, and they had one child. I know nothing about whether he ever had a significant marital problem. 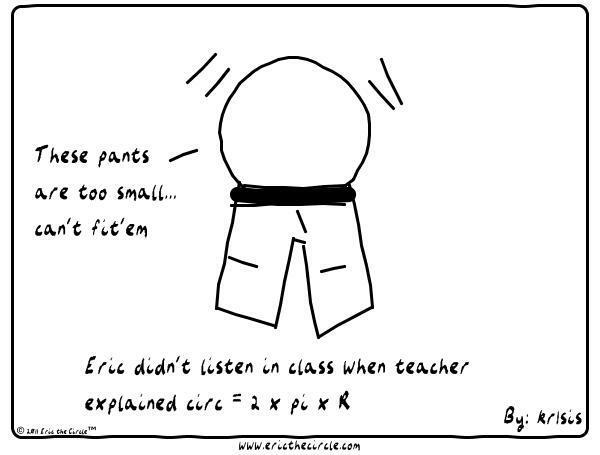 This past week was much busier for mathematically-themed comic strips. There’s going to be at least one more essay this week. There might be two. They’ll appear here, along with all the other Reading the Comics posts. I have a tradition at the end of an A To Z sequence of looking back and considering what I learned doing it. Sometimes this is mathematics I’ve learned. At the risk of spoiling the magic, I don’t know as much as I present myself as knowing. I’ll often take an essay topic and study up before writing, and hope that I look competent enough that nobody seriously questions me. Yes, I thought I was a pretty good student journalist back in the day, and harbored fantasies of doing that for a career. This before I went on to fantasize about doing mathematics. Still; I also learn things about writing in doing a big writing project like this. And now I’ve had some breathing space to sit and think. I can try finding out what I thought. The major differences between this A To Z and those of past years was scheduling. Through 2017 I’d done A To Z’s posted three days a week. This is a thrilling schedule. It makes it easy to have full weeks, even full months, with some original posting every day. I can tell myself that the number of posts doesn’t matter. It’s the quality that does. It doesn’t work. I tend toward compulsive behavior and a-post-a-day is so gratifying. But I also knew that the last quarter of 2018 would be busy and I had to cut something down. Some of that is Reading the Comics posts. Including pictures of each comic I discuss adds considerably to the production time. This is not least because I feel I can’t reasonably claim Fair Use of the comics without writing something of more substance. Moving files around and writing alt-text for the images also takes time. But the time can be worth it. Doing that has sometimes made me think longer, or even better, about the comics. So switching to two-a-week seemed the thing to do. It would spread the A To Z over three months, but that’s not bad. I figured to prove out whether that schedule worked. If I could find one that let me do possibly several A To Z sequences in a year that’d be wonderful too. I’ve only done that once, so far, in 2016, but I think the exercise is always good if exhausting for me. This completely failed to save time. I had fewer things to write, but somehow, I only wrote more. All my writing’s getting longer as I go on, yes. Last year my average post exceeded a thousand words, though, and that counts Reading the Comics and pointers to things I’ve been reading and all that. There’s a similar steady expansion going on in my humor blog. Possibly having more time between essays encouraged me to write longer for each. Work famously expands to fit the time available, and having as many as three full days to write, rather than one, might be dangerous. For the first time in an A To Z I never got ahead of myself. I would, at best, be researching and making notes for the next essay while waiting for the current one to post. There’s value in dangerous writing. But I don’t like that as a habit. Another scheduling change was in how I took topic suggestions. In the past I’d thrown the whole alphabet open at once. This time I broke the alphabet into a couple of pieces, and asked for about one-quarter at a time. This, overall, worked. For one, it gave me more chances to talk about the A To Z. Talking about something is one of the non-annoying ways to advertise a thing. And I think it helped a greater variety of people suggest topics. I did have more collisions this time around, letters for which several people suggested different ideas. That’s a happy situation to have. Thinking of what to write is the hard part; going on about a topic someone else named? That’s easy. So I’ll certainly keep that. I did write some about maybe doing supplementary pieces, based on topics I didn’t use for the main line. Might yet do that, perhaps under rules where I do one a week, or limit myself to 700 words, or something like that. It might be worth doing a couple just to have a buffer against weeks that there’s no comic strips worth discussing. Or to head off gaps next time around, although that would spoil some letters for people. Also I completely ran out of ‘X’ topics, and went with the 90s alternative of “extreme”. There are plenty of “extreme” things in mathematics I could write about. But that feels a bit chintzy to do too often. This time around I changed focus on many of my essays. It wasn’t a conscious thing, not to start with. But I got to writing more about the meaning and significance and cultural import of topics, rather than definitions or descriptions of the use of things. This is a natural direction to go for a topic like Fermat’s Last Theorem, or the Infinite Monkey Theorem, or mathematics jokes. I liked the way those pieces turned out, though, and tried doing more of it. This likely helped the essays grow so long. Context demands space, after all. And more thinking. Thinking’s the hard part of writing, but it’s also fun, because when you’re thinking about a subject you aren’t typing any specific words. But it’s probably a worthwhile shift. For a pop mathematics blog to describe what makes something a “smooth” function is all right. But it’s not a story unless it says why we should care. That’s more about context than about definitions, which anyone could get by typing ‘mathworld smooth’ into DuckDuckGo. For all the trouble this causes me, it’s the way to go. Every good lesson carries its opposite along, though. One of the requests this time around was about Lord Kelvin. There’s no end of things you can write about him: he did important work in basically every field of science and mathematics as the 19th century knew it. It’s easy to start writing about his work and never stop. I did the opposite, taking one tiny and often-overlooked piece and focusing on that. I’m not sure it alone would convince anyone of Kelvin’s exhaustive greatness. But I don’t imagine anyone interested in reading a single essay on Kelvin would never read a second one. It seems to me a couple narrow-focus essays help in that context. Seeing more of one detail gives scale to the big picture. I’ve done just the one A To Z the last two years. There’s surely an optimal rate for doing these. The sequences are usually good for my readership. My experience, tracking monthly readership figures, suggests that just posting more often is good for my readership. They’re also the thing I write that most directly solicits reader responses. They’re also exhausting. The last several letters are always a challenge. The weeks after a sequence is completed I collapse into a little recuperative bubble. So I want to do these as much as I can without burning out on the idea. Also without overloading Thomas Dye, who’s been so good as to make the snappy banners for these pieces. He has his own projects, including the web comic Projection Edge , to worry about. More than once a year is probably sustainable. I may also want to stack this with hosting the Playful Mathematics Education Blog Carnival again, if I’m able to this year. Deep down, though, I think the best moment of my Fall 2018 A To Z might have been in the first. I wrote about asymptotes and realized I could put in ordinary words why they were a thing worth having. If I could have three insights like that a year I’d be a great mathematics writer. I put a roster of things written up in this A To Z at this page. The Summer 2015 A To Z essays should be here. The essays from the Leap Day 2016 A To Z essays are at this link. The essays from the End 2016 A To Z essays are here. Those from the Summer 2017 A To Z sequence are at this link. And I should keep using the A-To-Z tag, so all of these, and any future A To Z essays, should appear at this link. Thank you for reading along. It’s looking as though WordPress has really and permanently discontinued its year-in-review posts. That’s a shame. They had this animation that presented your year as a set of fireworks, one for each post, paced the same way your posts for the year were. The size of the fireworks explosion corresponded to how much it was liked or drew comments or something. Great stuff. Haven’t seen it in a couple of years. The web washes away everything whimsical. I can do it manually, at least, looking at the summaries for yearly readership and all that. It’s just a bit different from the monthly reviews. And then I can see what lessons I draw from that, and go on to ignore them all. My impression of 2018 had been that I’d had a mildly better-read year than I had in 2017, but that my comments and likes had cratered. That is, people might find something they wanted to read, but saw no reason to stick around and chat with me, which I understand. But here’s what the data says. And, for the sake of convenience, let me put things since 2012 — my first full year — in a coherent table. The 2012 visitors count doesn’t; they only started keeping track of those numbers (where they’d admit to us) partway through the year. 2015 you can see was a busy year. That’s the first year I did an A-To-Z sequence, and that got a fantastic response. In 2016 I tried two over the year and while neither was as well-received, it did turn out nicely. 2017 and 2018 had a single A-To-Z sequence each. I’m surprised how nearly I track to a post every other day over seven years straight. And I’m surprised that my page-view count grew by about one-third from 2017 to 2018. And that unique visitors grew by about the same amount, and has been except for 2016-to-2017. I’m certainly not doing much to be better about promoting myself, so something else is at work. The evaporating number of likes and comments I can’t explain. It’s looking like 2015 and 2016 were exceptional years, but what was the exception? Fascinating, to me, is that only one piece (the Playful Mathematics Education Blog Carnival) was posted in 2018. But overall it suggests I should start more pieces with the tag “How to … ”. I’m quite surprised to have so many readers from the Philippines and wonder if some peculiar event happened, like a teacher told the school to look at my piece about the number of grooves on a record. I figured to appeal more to countries where English is a primary language, and know I have a strong United States cultural bias. 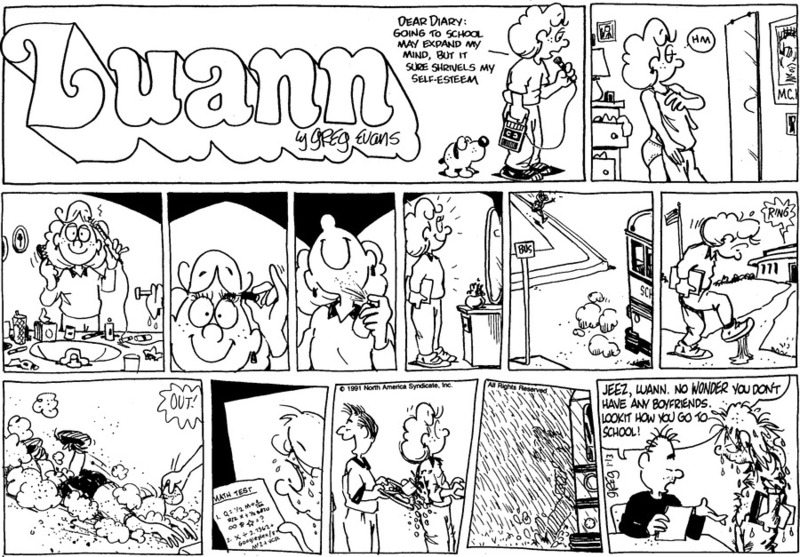 (Quick, name a non-American comic strip that’s ever got into a Reading The Comics post. Time’s up! You were trying to think of Sandra Bell-Lundy’s Between Friends .) But the gap in readers per capita between, say, the United States and Canada seems more than I should have expected. In all, in 2018, I posted 182 things. They came out to 186,612 words overall, for an average of 1,025 words per post. On average posts attracted 5.3 likes, and 2.8 comments. Seems as though I could do more. I don’t really know what. 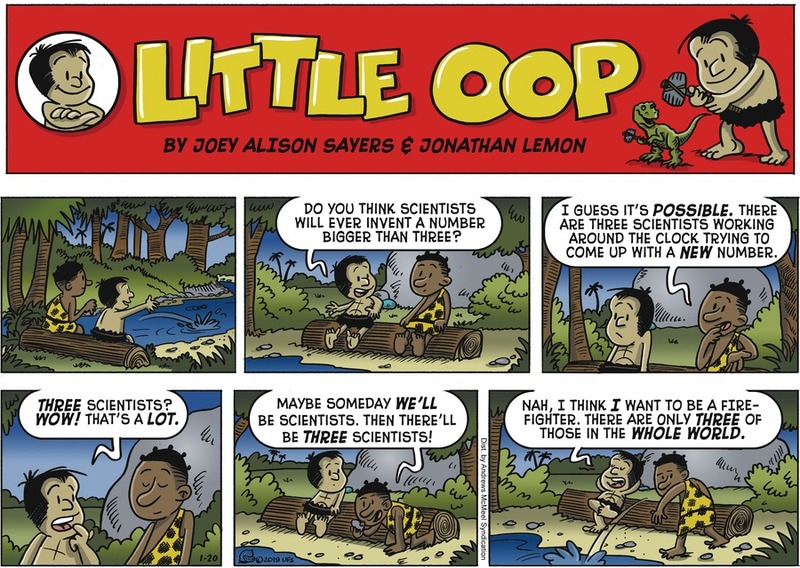 As I said Sunday, last week was a slow one for mathematically-themed comic strips. Here’s the second half of them. They’re not tightly on point. But that’s all right. They all have titles starting with ‘A’. I mean if you ignore the article ‘the’, the way we usually do when alphabetizing titles. Tony Cochran’s Agnes for the 11th is basically a name-drop of mathematics. The joke would be unchanged if the teacher asked Agnes to circle all the adjectives in a sentence, or something like that. But there are historically links between religious thinking and mathematics. The Pythagoreans, for example, always a great and incredible starting point for any mathematical topic or just some preposterous jokes that might have nothing to do with their reality, were at least as much a religious and philosophical cult. For a long while in the Western tradition, the people with the time and training to do advanced mathematics work were often working for the church. Even as people were more able to specialize, a mystic streak remained. It’s easy to understand why. Mathematics promises to speak about things that are universally true. It encourages thinking about the infinite. It encourages thinking about the infinitely tiny. It courts paradoxes as difficult as any religious Mystery. It’s easy to snark at someone who takes numerology seriously. But I’m not sure the impulse that sees magic in arithmetic is different to the one that sees something supernatural in a “transfinite” item. Tony Cochran’s Agnes for the 11th of January, 2019. I’m always glad to have the chance to write about Agnes , and you can see things I’ve written about it at this link. 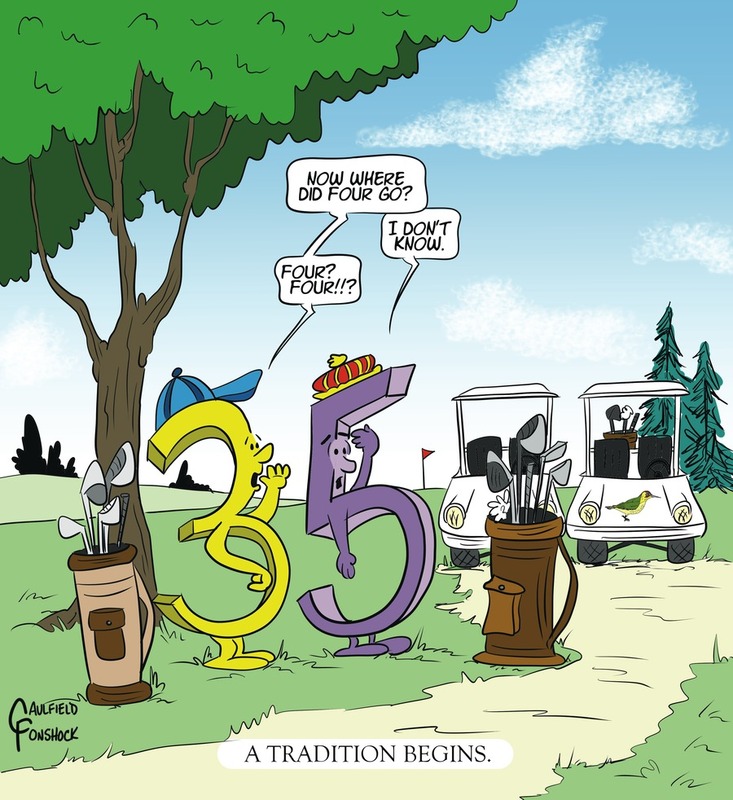 Scott Hilburn’s The Argyle Sweater for the 11th is another mistimed Pi Day joke. π is, famously, an irrational number. But so is every number, except for a handful of strange ones that we’ve happened to find interesting. That π should go on and on follows from what an irrational number means. It’s a bit surprising the 4 didn’t know all this before they married. Scott Hilburn’s The Argyle Sweater for the 11th of January, 2019. It’s not quite the most common strip mentioned here. 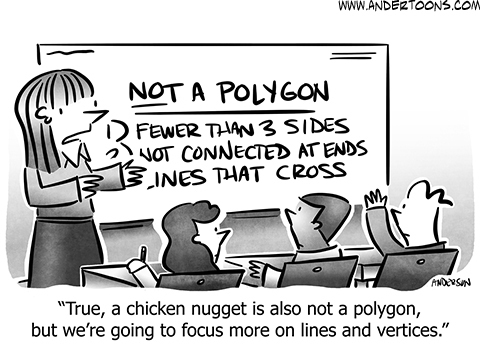 But you can find other topics raised by The Argyle Sweater at this link. I appreciate the secondary joke that the marriage counselor is a “Hugh Jripov”, and the counselor’s being a ripoff is signaled by being a &div; sign. It suggests that maybe successful reconciliation isn’t an option. I’m curious why the letters ‘POV’ are doubled, in the diploma there. In a strip with tighter drafting I’d think it was suggesting the way a glass frame will distort an image. But Hilburn draws much more loosely than that. I don’t know if it means anything. Mark Anderson’s Andertoons for the 12th of January, 2019. There’s more essays with Andertoons at this link. 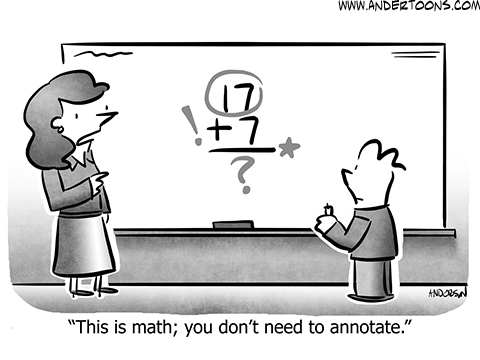 Mark Anderson’s Andertoons for the 12th is the Mark Anderson’s Andertoons for the essay. I’m so relieved to have a regular stream of these again. The teacher thinks Wavehead doesn’t need to annotate his work. And maybe so. But writing down thoughts about a problem is often good practice. If you don’t know what to do, or you aren’t sure how to do what you want? Absolutely write down notes. List the things you’d want to do. Or things you’d want to know. Ways you could check your answer. Ways that you might work similar problems. Easier problems that resemble the one you want to do. You find answers by thinking about what you know, and the implications of what you know. Writing these thoughts out encourages you to find interesting true things. And this was too marginal a mention of mathematics even for me, even on a slow week. But Georgia Dunn’s Breaking Cat News for the 12th has a cat having a nightmare about mathematics class. And it’s a fun comic strip that I’d like people to notice more. And that’s as many comics as I have to talk about from last week. Sunday, I should have another Reading the Comics post and it’ll be at this link.